DULUTH, Minn. - The No. 9 Minnesota Duluth Bulldogs scored two first period goals and then held off a comeback from the No. 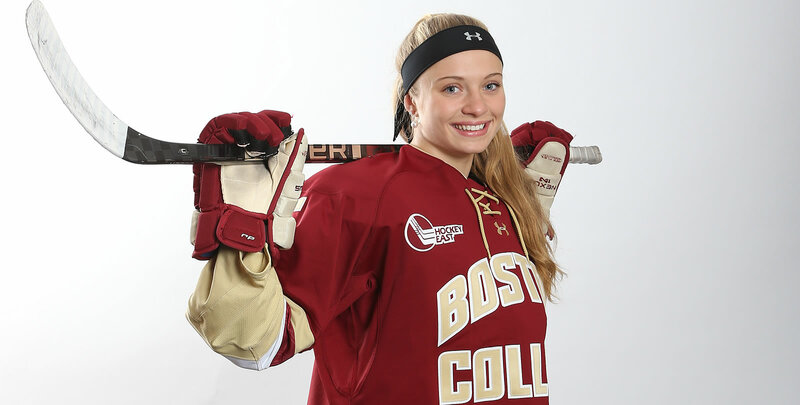 4 Boston College women's hockey team for a 2-1 win on Saturday afternoon at Amsoil Arena. Savannah Norcross scored her first career goal as an Eagle while Kelly Browne tallied her first career point with an assist on the goal. Maddy McArthur had an active opening 90 seconds, making two key blocker saves, but for the second night in a row, it would be UMD that struck first. With the early 1-0 lead, the Bulldogs went on to earn the first power-play of the game but a save from McArthur and a big block from Makenna Newkirk on a shot from the high slot killed it off. While BC couldn't convert on its own power-play in the period, UMD did on its opportunity to take a 2-0 lead into the intermission. Five minutes into the middle frame, the Eagles got another power-play chance. BC did well to move the puck around the zone, with Grace Bizal and Kali Flanagan getting a few looks each but nothing went in. Later in the period, though, the Eagles had chances early on in a power-play and eventually Norcross wristed home her first career goal to half the deficit. With a one-goal deficit but the momentum on its side - and the remaining 47 seconds of a power-play - BC came out buzzing at the start of the final frame. Another power-play saw another slew of chances for the Eagle but couldn't convert. McArthur had a big short-handed breakaway stop and another odd-man save a minute later to keep the game within reach. UMD, though, held off the furious BC comeback that included 12 shot attempts over the final six minutes of play. McArthur finished with 21 saves on 23 UMD shot attempts while Maddie Rooney made 26 stops on 27 BC shot attempts. BC was 3-for-6 on the power-play while UMD was 5-for-10. Amsoil Arena | Duluth, Minn.
1st, 3:33 | 0-1, UMD GOAL: After an initial shot from Maggie Flaherty that was blocked by Serena Sommerfield, Ryleigh Houston collected the rebound and moved in on net to fire it inside the far right post. 1st, 16:21 | 0-2, UMD GOAL: With the Bulldogs working the puck around the zone on a power-play, Kailee Skinner sent the puck across the top of the crease to a waiting Maggie Flaherty near the right post for a one-timer. 2nd, 3:31 | 1-2, BC GOAL: After Erin Connolly and Browne moved the puck to the corner on Rooney's blocker side, Norcross dug the puck out. She skated up the circle, turned and wristed a shot that beat Rooney's glove and went into the top right corner. - With the win, UMD takes an 8-6-1 edge in the all-time series. - Beginning with a power-play with 5:16 remaining in the second to the end of the period, the Eagles had 11 consecutive shot attempts; one shot went in, one hit a pipe, four were blocked, four were saved and one was wide. - To end the game, the Eagles went on a 12-0 shot attempt run. - Savannah Norcross and Kelly Browne both registered the first points of their career. - This is the first time since the 2012-13 season that the Eagles have started the season 0-2. - Head coach Katie Crowley is now 6-7-1 in the all-time series with the Bulldogs. Boston College will return home next weekend to start a five-game home stand. Syracuse will make the trip to Chestnut Hill on Saturday, Oct. 6 for a 2 p.m. game.